Tate & Lyles Black Treacle is largely the same as molasses or unrefined black syrup. A wonderful aroma for the use in Water Kefir. Black treacle in non-crystallized form. 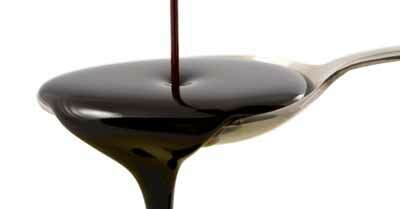 The most common types of molasses, are known as Blackstrap or Black Treacle. Black treacle or molasses has a remarkably strong and slightly bitter taste. Black strap is a common sweetener and spice in British cookery. Also molasses as raw material is extensively used in the fermentation industry (in the production of rum, dark beer and soy sauce), so also ideal for use as a seasoning of Water Kefir. Cane sugar molasses contains significant amounts of vitamin B6 and minerals, including calcium, magnesium, iron and manganese; a tablespoon offers up to 20% of the recommended daily value of each of these nutrients. Blackstrap is also a good source of potassium. Molasses has long been sold as a dietary supplement.